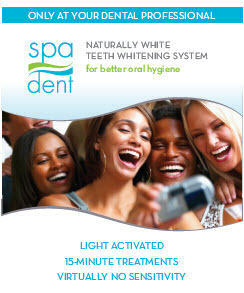 Our office has an updated in-office light-activated whitening technique; please click on the link for more information on our SPADENT in-office whitening. Professional tooth whitening provides a safe and noninvasive way to restore teeth to their natural brilliance. Unlike over-the-counter whitening kits, professional bleaching will not harm your enamel. Instead of relying on harsh chemical agents, we use light-activated whitening technology to safely, conveniently, and thoroughly give you a whiter, more attractive smile. Why Choose Professional Dental Whitening? In addition to being safer and gentler than over-the-counter whitening kits, professional dental whitening delivers more predictable results. After Dr. Ly lightens your enamel, he will assess your existing restorations in order to determine their color compatibility. Sometimes fillings, crowns, and veneers also become stained over time. It means that they will need to be replaced in order to match your new, whiter smile—a service only a professional dentist like Dr. Ly can provide. By choosing in-office whitening, you ensure that every part of your smile will be beautifully brightened. What’s more, Dr. Ly can perform touch-up appointments every few years to help you maintain optimal tooth whiteness. Most people know that smoking stains tooth enamel. But few people are aware of the fact that many non-smokers are also at risk of tooth discoloration. Consuming beverages rich in tannins (such as tea, coffee, and wine), using certain medications, and interact with too much fluoride can also stain the teeth. Likewise, some people experience enamel loss due to acid erosion or tooth grinding, and this leaves teeth more prone to staining. At Davis Dental Care, we can complete teeth whitening procedure in half an hour or less, making it one of the fastest ways to improve the appearance of your smile. Though teeth whitening procedure itself is painless, it sometimes results in temporary sensitivity. Rest assured that this effect will wear off naturally over time; it’s not a sign that your teeth have been damaged by the treatment. Most patients who receive SPADENT whitening do not experience any sensitivity, thanks to the gentle nature of this innovative new treatment. Once you have received your whitening treatment, Dr. Ly will give you aftercare instructions to help you maximize the results. You will also have the option of coming in for additional follow-up appointments to continue working on improving the aesthetics of your smile.